The Billionty-Oneth Geek: Ring of Honor returns to Toronto!!! Ring of Honor returns to Toronto!!! 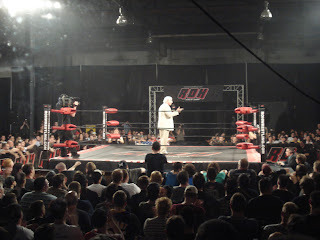 Ring of Honor Wrestling returned to Toronto and put on two shows in a row at Ted Reeve's Arena. Leading up to this weekend's events, fans were unsure what was exactly going to happen. You see, right now Toronto city workers have been on strike for well over a month, with no garbage pick-ups since it began. Instead, certain city owned parks and parking lots have been made temporary dump sites for people to dispose of their garbage. Ted Reeve's Arena was one such dump site. The parking lot is filled with so much garbage that they had to close it off to dumping (it's maximum allowable capacity is at 1,250 tonnes). So we had a stinky arena and all that garbage outside of it. THANKFULLY, and I don't know how they did it, but the arena inside did not smell as bad as it did last year (when there wasn't all that garbage). The fans packed the arena on both nights to see some of their favourite indie wrestlers grapple and fight their way to victory. 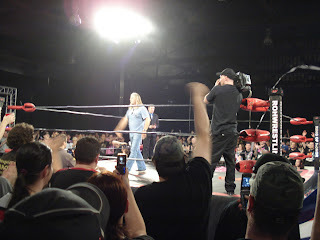 Some wrestling veterans even made special appearances on behalf of Ring of Honor, such as Ric Flair, Bret "The Hitman" Hart, and Lance Storm (who competed on both nights). It was really great seeing these guys and hearing them speak (even if it was for a short period). 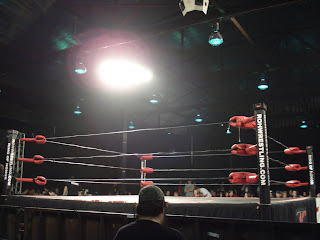 I got to see my favourite wrestler, Tyler Black, wrestle both nights too, so I went away happy. I sent in the results of both nights to Dave Meltzer and he posted them up on F4W. If you'd like to view the results you can see night one's (here) and night two's (here). I've included a few pictures that I took below. You can check out the rest of the pictures (here). Lance Storm with the half boston crab on Chris Hero.